Copyright © 2010 Rosemarie Rossetti, Ph.D. I am sitting in my new office in my new home, the Universal Design Living Laboratory (www.udll.com) in Columbus, Ohio, writing my first article with a small notebook on my lap. The home is halfway finished, with the framing complete and windows installed. (You can watch the construction process through our live site cam and our online construction photo gallery). For the past five years, my husband, Mark Leder, and I have been working with a team of designers to build this model home and garden center as a way to demonstrate universal design and green building principles. Our architect, Patrick Manley, RA, AIAA, ALA (www.manleyarchitects.us), and our interior designer, Anna Lyon, Allied ASID, assisted us with our floor plan. These were then sent to Mary Jo Peterson, CKD, CBD (www.mjpdesign.com), a nationally known universal design expert and kitchen and bath designer. Peterson worked on the detailed design for the kitchen, roll-in pantry, bathrooms, and wardrobe. She extensively interviewed Mark and me about how we planned to use the kitchen. She also gave us a questionnaire so she could record measurements, such as our height and arm reach, and my wheelchair dimensions. Peterson’s kitchen and roll-in pantry plan included specifications for the base cabinets, wall cabinets, center island, and location for all appliances and sink. She also guided us in selecting the appliances, sink and cabinet manufacturers. We chose KraftMaid (www.kraftmaid.com) for all cabinets in the home. We selected their Passport series which has a 9-inch high by 6-inch deep toe kick that offers plenty of space for wheelchairs or other mobility devices. When I pull up forward to the 34-inch high countertop of the base cabinets, the larger toe kick will give me an additional 2-inch reach at the countertop. In Peterson’s kitchen design, there is 14-inch between the countertop and the bottom of the wall cabinets. This makes it easier to access items on the wall cabinet shelves from a seated position. In a traditional kitchen this space is 18 inches. We also plan to install a Hafele (www.hafele.com/us/) pull down shelf unit so that the contents of the shelf can be lowered to my seated level. The center island has three heights to accommodate people of all sizes who work in the kitchen. The microwave and oven will be installed in the section that is 40½ inches high. A second section has a 34-inch high countertop. The table section of this center island is 30½ inches from the floor with seating for four. There is also a dining room in the kitchen with seating for 10 people. When Peterson completed the plans for the kitchen and roll in pantry, they were given to Dan Medley, design special projects supervisor, at KraftMaid. Mark and I attended a meeting in the KraftMaid showroom with Medley and Lyon where we selected features, including full extension shelves, pull-out drawers, recycling bins, cutlery drawers, and rotating pantry shelves. We also selected the door design, wood species, stain color, and hardware for the cabinets. Medley created color 3-D renderings, plans, and elevations so the entire design team could review them. He included locations for the electrical outlets, and controls for the lighting, garbage disposal and range hood so I could reach them from my wheelchair. During the construction, Medley came to the home for field measurements so exact specifications could be put in the plans. During this kitchen design process, Lyon, Mark and I met with the lighting designer, Ardra Zinkon of Tec Inc. Engineering & Design (www.tecinc1.com) to select fixtures and plan their placement. We have had numerous meetings with Lyon to select kitchen flooring, wall tiles, and countertops. Mark and I worked with the appliance manufacturers to make our selections at their exhibits and showrooms around the country. 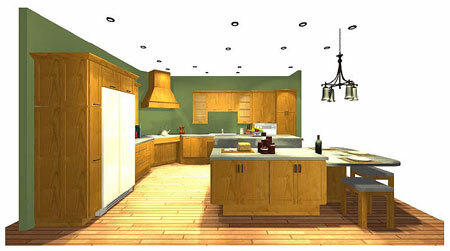 The kitchen is the most critical room when it comes to utilizing universal design. Care must be taken to ensure adequate turning space for a person in a wheelchair. Knee space is needed under the sink and cooktop. Advance planning is extremely important to get it right. The team approach worked well for us as we drew upon the expertise of many professionals. I look forward to the day when I can sit my kitchen table and write a follow-up article and show you the finished results. 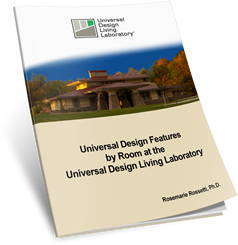 Rosemarie Rossetti, PhD is building a national model universal design home in Columbus, Ohio. 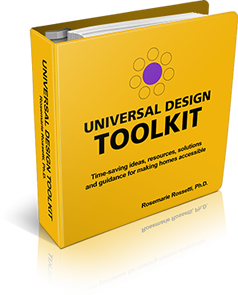 To learn more about the Universal Design go to: www.UDLL.com.